In the list of Sustainable Development Goals (SDGs) and their associated targets, the word ‘science’ appears 10 times; ‘technology’ shows up 31 times and finally ‘innovation’ reveals itself 17 times. Clearly, Science, Technology and Innovation (STI) are seen as important instruments that can help the world attain the SDGs — and why UNU-MERIT and partners will join the first ever STI Forum at UN Headquarters, New York. STI has multiple roles. First, they are goals in themselves, as for example Goal 9, which is to “Build resilient infrastructure, promote inclusive and sustainable industrialization and foster innovation”. Second, science is recognised as forming the knowledge base for the improvement of existing technology and the creation of innovations. Third, it is acknowledged that while capabilities in STI generation, exploitation, transformation and diffusion are essential to all countries, currently, there is enormous heterogeneity between the different countries of the world. Thus, while building upon existing capabilities, there is a need to reduce this inequality for effective partnership. The SDGs expand upon the earlier Millennium Development Goals or the MDGs, and while they do so, they still remain subject to the same challenges. For instance, there is a very important lack of data and lack of measurability for some indicators that in turn hinder our capacity to assess our progress towards SDGs. 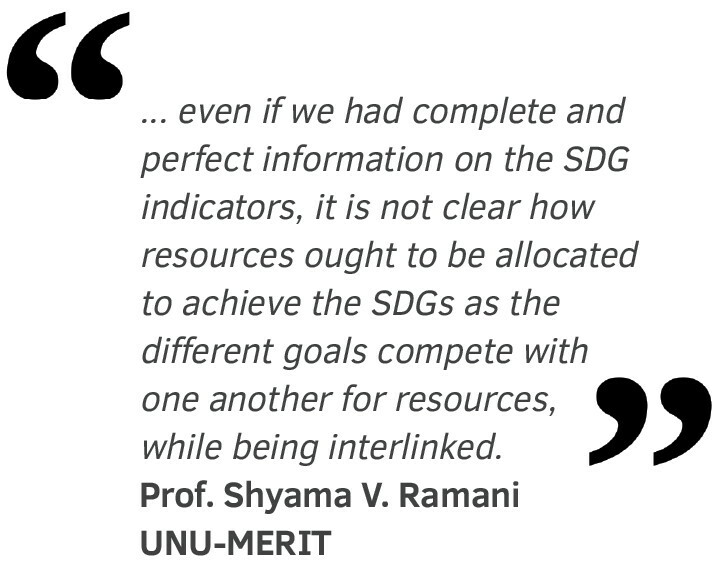 But, even if we had complete and perfect information on the SDG indicators, it is not clear how resources ought to be allocated to achieve the SDGs as the different goals compete with one another for resources, while being interlinked. Over time, resource allocation occurs as outcomes of bargaining between different actors. This applies to STI investment as well. In other words, it’s all a matter of politics at different levels. And as responsible citizens – we also need to reflect and contribute to this decision making. Should we push for a visible STI investment in new laboratories, technology parks or software companies or invisible investment on science that can trigger new technologies, pro-poor innovations or simply better technology designs and organisational platforms that can make a big difference? These are very difficult choices. And to help us make better choices – in this panel session – with concrete examples from experts – we are going to explore how we can make STI work for SDGs. STIs emerge and evolve within national and sectoral systems of innovation. These systems, marked in terms of national or sectoral affiliations, contain all economic actors — i.e., stakeholders who influence how STI contributes to economic growth and inclusive development. They include the state, public-private agencies, universities, public laboratories, firms, financial organisations, NGOs, civil society groups, consumers, etc. These actors are connected in many ways, either directly or via intermediaries and tools that impact performance. Therefore, how STI serves SDGs will be decided by the choices of these systemic players across countries and sectors, which in turn are influenced by how the ecosystem supports them through diverse policy designs. In addition, players’ actions are shaped by the implicit and explicit rules of the game at multi-levels in the form of established practices, rules or laws, social norms, fashions, etc. that guide the relations and interactions between individuals, groups and organisations. The SDGs combine traditional challenges such as poverty and economic growth with complementary sectoral burdens (and global challenges) like education, environment and energy sustainability, ageing population etc., while giving renewed importance to the evolution of nature and climate change as factors impacting societal welfare. Keeping in mind the complexities of the role of STI in each of these goals and the constraint of limited time, our session will focus on STI in three essential commodity sectors that especially impact the lives of the poor: i) food (cereals that feed the world), ii) medicines, and iii) water & sanitation within diverse national and regional systems. We will then touch upon their links with the other SDGs. Even as globalisation marches on relentlessly, there is an increasing focus on the ‘local context’ as a unit of analysis for understanding and policy impact, given the enormous heterogeneity of problems within the same nation or region. As focus shifts from a universal domain to a specific context, it is very clear that there can be no solution or solution platform that is universally optimal. A solution has to be designed differently for each context depending on the objective desired, and supported by reliable and efficient supporting organisations (i.e., intermediaries, facilitators, NGOs, etc.). Thus, this panel will cover the implications of STI and the role of innovation as growth engines for both developed and developing countries. Finally, the attainment of the SDGs calls not only for public investment, but also the participation of all systemic stakeholders. This is because of the diversity of challenges, resource constraints and time schedules for progress. Moreover, the SDG pathways have to be compatible with the objectives, resources, capabilities and social norms of the agents constituting and giving life to the ecosystem. Therefore, each speaker will explain the kinds of cooperation between diverse actor-groups, and the nature of changes in systemic rules that can facilitate positive transformations through STI investment. Moderator: STI systems and SDG goals – Why recognition of complexity within a systemic view matters. 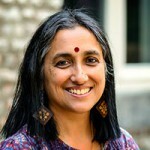 Prof. Shyama V. Ramani, UNU-MERIT. For more information on the STI Forum for the SDGs, visit the Forum website.